For a long time, I felt like my life was missing something. I didn’t fit in very well with the people around me, and I knew that I wasn’t going to find what I was searching for if I stayed where I was. I applied for many different jobs on CoolWorks.com. I had no idea what to expect, or what my job would be like. I knew everything I would soon be surrounded by would be new and unfamiliar. I was scared, excited, and could not wait to take my journey into the unknown. Yellowstone Park Hotel – I was a front desk clerk and shared my love for Yellowstone Country to the people that were there to enjoy it just as much as me. I had a great boss that showed so much respect for his employees and the guests. Glacier Raft Company – I worked and lived right next to Glacier National Park. I went whitewater rafting and kayaking for free on my days off. The housing is very close to where you work, within walking distance. I could also rent out paddleboards to go out on Lake McDonald. I loved the whitewater kayaking more than anything, being out on the water, in the moment where nothing else matters but complete solitude. Hiking in Glacier National Park was spectacular, along the Highline Trail looking over Heaven’s Peak. Walking through the mountain passes felt like walking through a dream. Worldmark by Wyndham Hotel in West Yellowstone – Being so close to Yellowstone National Park in the winter is like living in a whole different world, with endless snowmobiling in the most beautiful wilderness, and snow coach tours that take you through Yellowstone National Park. Snowmobiling to Two Top Mountain right outside of West Yellowstone was one of my favorite experiences, with glimmering snow shining on the trees, riding all the way up to the top, and taking in the views of all the ghost trees and untouched nature. Ridgeline Hotel in Estes Park, Colorado – Estes Park is at the entrance to Rocky Mountain National Park. You can watch elk walk all over town and in the park, and see mountain wildflowers blooming everywhere. The black bears, the elk, the Rocky Mountains, and the beautiful lakes were more amazing than I could have imagined. My favorite part of working the CoolWorks jobs is that you get to live and work in such beautiful places. Doing this gives you the opportunity to have so many experiences right out your back door. Sequoia National Park at Wuksachi Lodge – This is my latest CoolWorks job! I work at the front desk, and live in the forest with all of the nature I could ask for right outside my front door. I love where I live, where I work, and life is always good when I get to be so close to the National Parks. Four years ago, CoolWorks changed my life with my very first seasonal job, so much that here I am still in love with working seasonal jobs in the National Parks, and I never want to go back to the life that I had before. These experiences have given me the opportunity to find a life filled with wonder, curiosity, different people, and experiences that I have yet to know. The people that I’ve lived and worked with are on a journey similar to mine, and I’ve had the best of times with people that were searching for new experiences just like me. The experiences I gained with people from all over the world that I had the chance to meet and learn from are irreplaceable. Taking a job that I found on CoolWorks changed my life forever and I am so thankful to have the opportunity to see my life and the world with new eyes. Where was the photo taken in Alyssa’s journal photo? The one overlooking the cliff! That looks gorgeous! 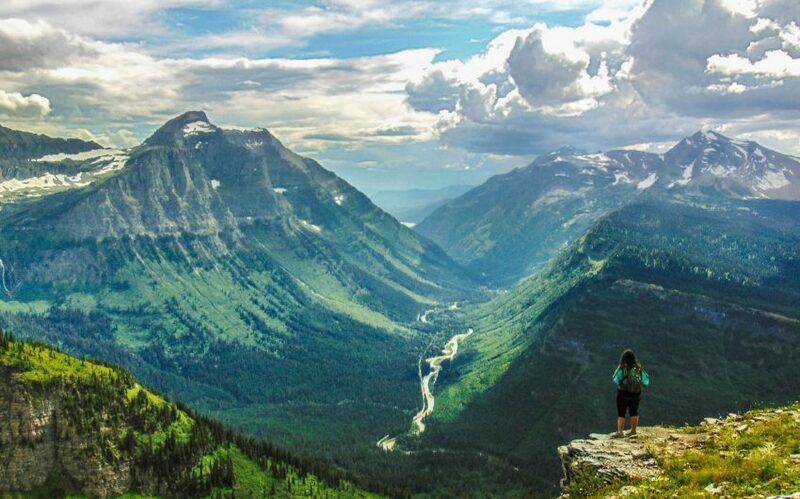 This is the Highline Trail in Glacier National Park. Overlooking the mountains of Logan’s Pass and the mountain on the right is called Heaven’s Peak. WOW! I am ready for our adventure and we are setting off May of 2019! We are excited to be leaving corporate world! We are in love with this world and want to see it all and meet people from all over. Life is pretty amazing and so are all the amazing places and people in it! This is a great post!